THIS FORM IS NOT FOR FOOD VENDORS. FOOD VENDORS SHOULD EMAIL SSMITH@ADMIN.MINTHILL.COM FOR MORE INFORMATION. 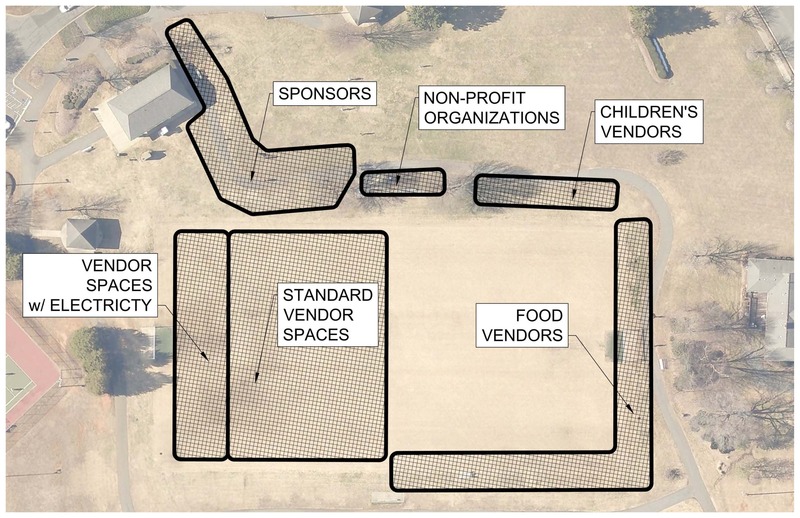 Vendor spaces are 10' x 10' and DO NOT include electricity. Electricity will be available to a limited number of spaces (see map below) for an additional fee. SMALL GENERATORS ARE ALLOWED IN THE CHILDREN'S AREA ONLY. NO GENERATORS WILL BE ALLOWED IN GENERAL AREA. Limited festival lighting will be available if you choose to remain open until 11:00 PM. I acknowledge and certify that I have read and agree to abide by the terms and conditions established by Mint Hill Events, Inc. I also agree to release and hold harmless Mint Hill Events, Inc., the Town of Mint Hill, its employees and volunteers; as well as the owners of any private property Mint Hill Madness utilizes from any damages, losses due to theft of the undersigned vendor's property, or for any personal injury which the vendor or anyone working for the vendor may sustain while participating in Mint Hill Madness.